You are here: Home › Where to Eat in Houston › All The Rave About Crave Cupcakes! All The Rave About Crave Cupcakes! Nothing conquers food craving for something sweet like a cupcake! For freshly baked cupcakes, Crave Cupcakes has everything needed to indulge yourself with a sweet treat. 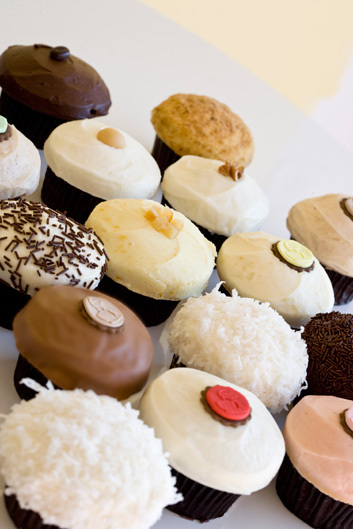 Crave Cupcakes offers a large variety of freshly baked cupcakes that change with every day of the week. Each morning, bakers combine Texas farm ingredients with chocolates, vanillas and fruits from around the globe to make delicious, freshly baked cupcakes and creamy frostings. All of their homemade desserts are preservative and hydrogenated oil free for incredible flavors that are bound to become addictive. The cupcakes are baked at various times of the day in small batches, guaranteeing every customer gets a fresh cupcake. If you stop by their Houston location (1151 Uptown Park Blvd, Ste 6, Houston, Texas 77056) Crave Cupcakes also offers beverages to go along with your tasty treats, such as cold bottles of milk, freshly brewed cups of coffee and Crave Coffee Chillers. Crave Cupcakes even services for weddings and special events as well. With all of the special decoration and party pack options you shouldn’t have a problem finding something you like. This bakery is determined to share their wonderful cupcakes all across the US. If you can’t make it to Crave Cupcakes, or would like to surprise someone special, the bakery delivers locally and nationally. View the online menu, treat yourself to the delicious world of Crave Cupcakes and then let us know what you think! 2 Responses to All The Rave About Crave Cupcakes! I love Crave! Easily my most favorite cupcake shop in Houston. Crave is simply the best! Do you have a particular cupcake that is your favorite there? I would have to go with strawberry for mine! Thank you so much for commenting!